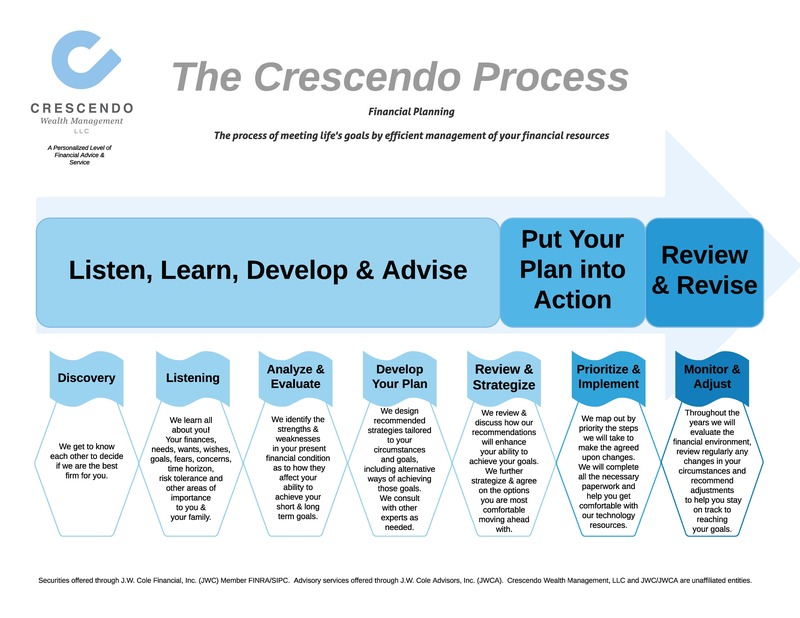 Please click on The Crescendo Process to view an illustration of how we work with you. Our philosophy is that your financial plan shouldn’t sit in a binder on a shelf. It needs to be accessible in real time because like the markets your life is every flowing and changing. Thus, when you work with us, we sit together and do co-planning. We build your plan as a team. To save time in building you may choose to have filled out our electronic questionnaire so some of the information can be prepopulated. If not, that’s okay we input it together. Once your information is all entered then we dig into the details. We believe that if the details aren’t right your plan won’t be right, so we do spend a far amount of time double checking things to make sure they all are as you understand them to be. Then we prioritize with you what areas of your plan we are going to focus on first, second and third and go from there.